Empathy is the ability to read and understand people and be in-tune with or resonate with others. Sometimes it is voluntary and at other times it can be involuntary, especially for someone who is a natural empath. Empaths are hypersensitive people who experience a high level of compassion, consideration, and understanding towards others. 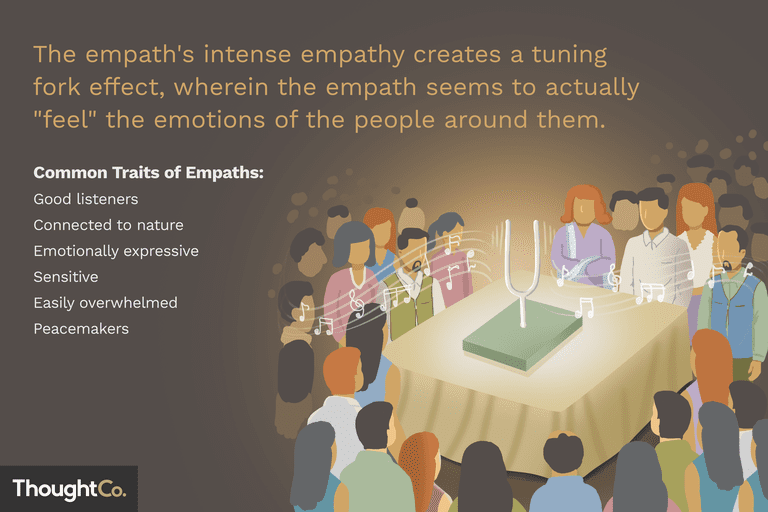 Their intense empathy creates a tuning fork effect, wherein the empath seems to actually "feel" the emotions of the people around them. Many empaths are unaware of how this works; they may have simply accepted long ago that they are sensitive to others. Whether they realize it or not, empaths share many common traits with other empaths. Many people learn to hide their authentic feelings and put on a show for the outside world. An empath can often sense and relate to a person's true emotions that run deeper than what they project on the surface. Empaths have a big heart and will act compassionately to help that person express herself. Empaths experience empathy towards family, children, friends, close associates, complete strangers, pets, plants, and even inanimate objects. Some are naturally more empathic towards animals (e.g., The Horse Whisperer), to nature, to the planetary system, to mechanical devices, to buildings, or to any variety of beings or things. Others will have a combination of some or all of these. Empathy is not held by time or space. Thus, an empath can feel the emotions of people and things at a distance. A deep sense of knowing accompanies empathy. While compassion and understanding are good virtues, they can also be problematic for an empath. At times, it may be difficult to distinguish one's own feelings from those of others. This is especially true when it comes to pain and suffering, which can be emotionally or physically demanding on someone who's empathic. For this reason, empaths can become reclusive at times simply because the outside world can be a great drain on their personal energy. There are also varying levels of strength in empaths. It may be related to the individual's awareness of self or their understanding of the powers of empathy. This could also be impacted by the acceptance or non-acceptance of empathy by those associated with them, including family and peers. Generally, those who are empathic grow up with these tendencies but do not learn about them until later in life. Empathy has both biological and spiritual aspects. Many people believe that empathy is genetic and passed from generation to generation. It is studied both by traditional science and alternative healing practitioners. While there is much we don't yet understand ​how empathy works, we do have some information. Everything has an energetic vibration or frequency and an empath is able to sense these vibrations. They can recognize even the subtlest changes that are undetectable to the naked eye or the five senses. Words of expression hold an energetic pattern that originates from the speaker. They have a specific meaning particular to the speaker. Behind that expression is a power or force-field, better known as energy. For example, hate often brings about an intense feeling that immediately accompanies the word. The word hate becomes strengthened with the speaker's feeling. It is that person's feelings (energy) that are picked up by empaths, whether the words are spoken, thought, or just felt without verbal or bodily expression. Empaths are often poets in motion. They are the born writers, singers, and artists with a high degree of creativity and imagination, so the artistic community is filled with them. They are known for many talents as their interests are varied, broad, and continual. They often have interests in many cultures and view them with a broad-minded perspective. Empaths encompass all walks of life and span every culture across the globe. You can find empaths within your family, neighborhood, workplace, and the broader community. There is no single defining gender, career, personality, or any other label that we can place on empaths in general, they are everywhere and can be anyone. These are the listeners of life. Empaths are often problem solvers, thinkers, and studiers of many things. As far as empaths are concerned, where there is a problem, there is also an answer. They will often search until they find one — if only for peace of mind. Empaths often possess the ability to sense others on many different levels. From their position in observing what another is saying, feeling, and thinking, they come to understand that person. They can also become very proficient at reading another person's body language and may intently study their eye movements. While this in itself is not empathy, it is something that stems from being observant of others. In a sense, empaths have a complete communication package. Empaths are often very affectionate in personality and expression, so they are great listeners and counselors. They will find themselves helping others and often putting their own needs aside to do so. This is why we find so many empaths in careers connected with compassion, such as healers, clergy, counselors, and caregivers. In the same breath, they can be much the opposite. They may be quiet and withdrawn from the outside world as they tend to be the listeners rather than the talkers. Empaths may include loners, those who are depressed or neurotic, life's daydreamers, or even narcissists. Empaths are often passionate towards nature and respect its bountiful beauty. One will frequently find empaths enjoying the outdoors, whether that is a walk on the sunny beach or a stroll in the rainy woods. Empaths may find themselves continually drawn to nature as a form of release. It is the opportune place to recapture their senses and gain a sense of peace in the hectic lives they may live. The time to get away from it all and unwind with nature becomes essential to the empath. Some empaths are more drawn to certain elements of nature, such as water. One might find herself attracted more towards ponds, rivers, or oceans as a place of peace. Others may feel more of a connection to the mountains or the deserts. Animals are often dear to the heart of empaths as well. It is not as a power object but as a natural love. It is not uncommon for empaths to have more than one pet in their homes. Stereotypes like "the crazy cat lady" or the animal communicator are often filled with emphatic souls. Empaths are often quiet and can take a while to handle a compliment. They're more inclined to point out someone else's positive attributes rather than their own. An empath tends to be highly expressive in all areas of emotional connection. They will talk openly, and, at times, quite frankly in respect to themselves. They typically do not have problems talking about their feelings. However, they can be the exact opposite as well. Empaths may be reclusive and apparently unresponsive at the best of times. This is a defense mechanism to avoid feeling overwhelmed by either a single experience or multiple encounters. Some empaths are very good at blocking out others. That's not always a bad thing, at least for the learning empath struggling with a barrage of emotions from others, as well as their own feelings. Empaths have a tendency to openly feel what is outside of them more so than what is inside of them. This can cause empaths to ignore their own needs. In general, an empath is non-violent, non-aggressive, and leans more towards being the peacemaker. Any area filled with disharmony creates an uncomfortable feeling in an empath. If they find themselves in the middle of a confrontation, they will endeavor to settle the situation as quickly as possible, if not avoid it all together. If any harsh words are expressed in defending themselves, they will likely resent their lack of self-control. The preference is to peacefully resolve the problem promptly. Empaths are sensitive to TV, videos, movies, news, and broadcasts. Violence or emotional dramas depicting shocking scenes of physical or emotional pain inflicted on adults, children, or animals can easily bring an empath to tears. At times, they may feel physically ill or choke back the tears. Some empaths will struggle to comprehend any such cruelty. They will have grave difficulty in expressing themselves in the face of another's ignorance, closed-mindedness, and obvious lack of compassion. They simply cannot justify the suffering they feel and see. People of all walks of life, as well as animals, are attracted to the warmth and genuine compassion of empaths. Regardless of whether others are aware that someone's empathic, people are naturally drawn to them as a metal object is to a magnet. Even complete strangers find it easy to talk to empaths about the most personal things. Before they know it, they have poured out their hearts and souls without intending to do so consciously. It is as though on a sub-conscious level that person knows instinctively that empaths would listen with compassionate understanding.